I have to admit that I was a bit skeptical when our good friend Keith Mould told us to save mid-July for a possible trip to South Africa. It’s not that Keith isn’t a capable and wonderfully resourceful fellow. 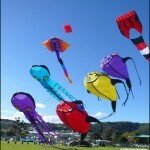 And the concept to piggy-back a kite show onto the popular Oyster Fest in Knysna made perfect sense. But let’s face it – bringing a couple of Americans in for a start-up event in Africa is expensive – especially with airfares rising every day! So pulling this off was a long shot. I should have never doubted Keith. Some people will go to extraordinary lengths to have friends over for dinner…. 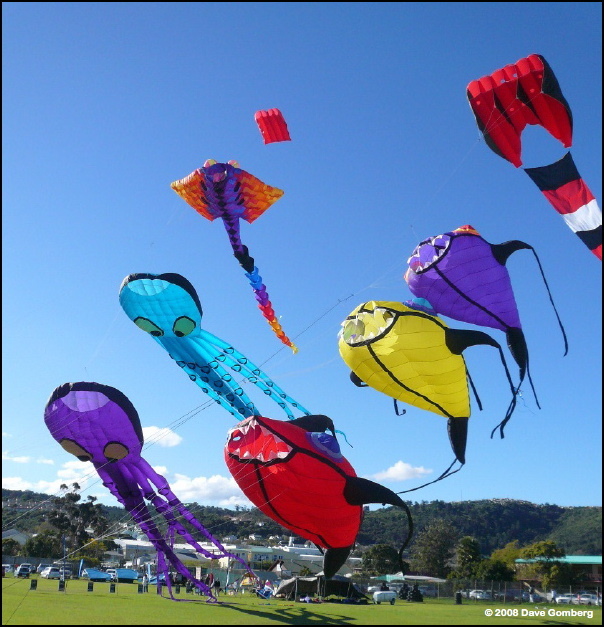 Knysna is a popular recreational destination along the Garden Route of Africa’s southern coast. And the Oyster Festival is a big winter draw here. Oysters are reputed to be effective aphrodisiacs and to promote virility. That attracts a good crowd! But all we know for sure is that they are slimy and low in cholesterol. 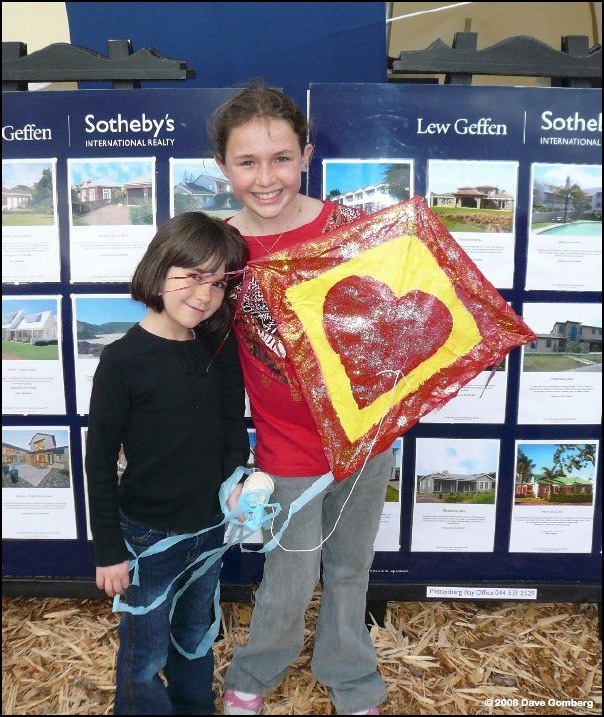 Our hosts were Lew Geffen Sotheby’s International Realty. 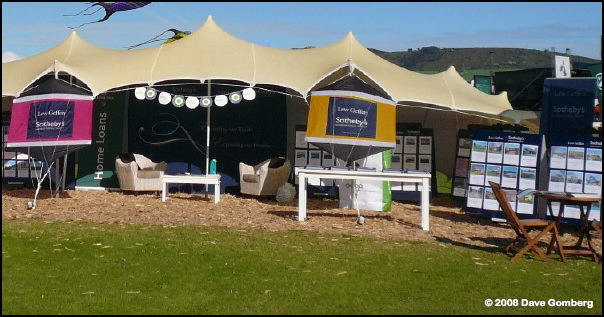 Their tented pavilion alongside the kite field showcased beautiful “larney” homes and apartments. 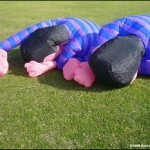 There were times it was hard to get Susie back out on the field and away from the listing sheets. BTW- “larney” is Africaans for “posh”. 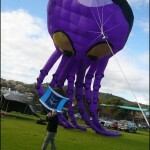 Out on the grassy field, we launched two Octopus, a Manta, a Crab, and a series of medium Fish. 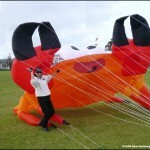 I joked that the Gomberg’s weren’t that great at flying, but brought in more free baggage than anyone else could! 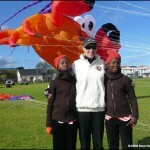 South African Air only allows one 40 pound bag per person. But somehow we arrived with six bags weighing 50-60 pounds each!! 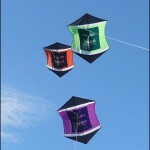 We also delivered a set of ten rokkus for the first ever African kite battle. 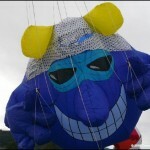 After a quick indoctrination, teams from various sponsors took to the air and were soon wearing big kite smiles. 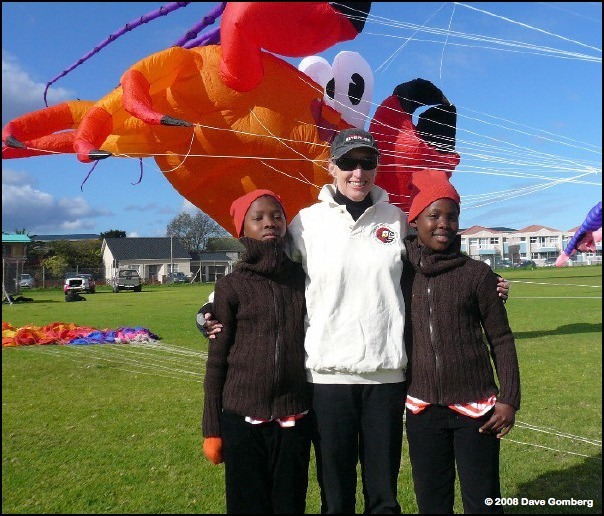 Joining us on the field were David and Nadia Sampson of Hi-Fly Kites in the Natal, and Greg and Jackie Mountjoy of Windsong Kites in Durban. 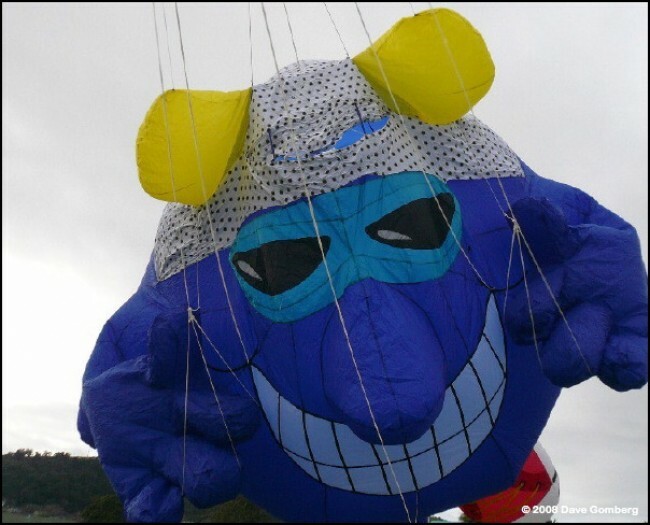 Dave and Ndia had a Blue Meanie that they had taken to a fun fly for kites in the local Lukemia Hospital. The kids each wore a bandana to cover their heads balding from chemo. When Meanie showed up with a matching bandana, he was a big hit! 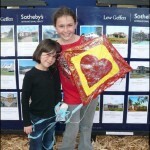 We also judged the Creative Kite Competition. 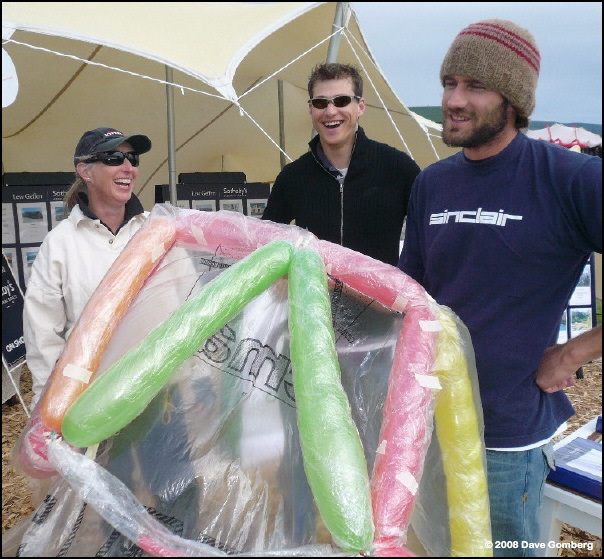 Entrants were limited to 20 rand in materials (about $1.50). 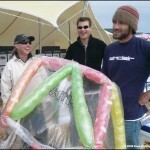 In the adult category, a group of architects use balloons for framing their unusual dual-line kite. 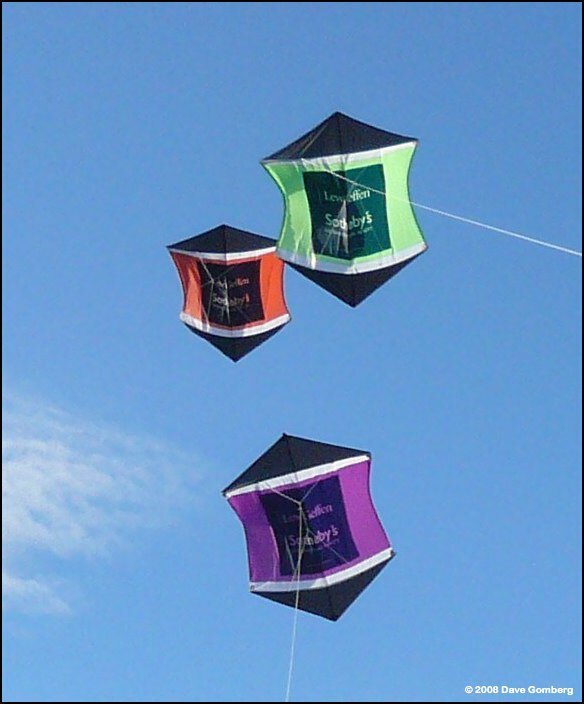 In the kid’s category the “Love Kite” was a big favorite. Winds dropped off early on Sunday and we packed for the trip home. Finishing early allowed us all to head out for a nice dinner. Bets were made over fine South African wines on whether we could get our bags back on the airplane. We’re flying home now – 25 hours in the air and two layovers – 6 hours in Johannesburg and another 12 in Washington DC. 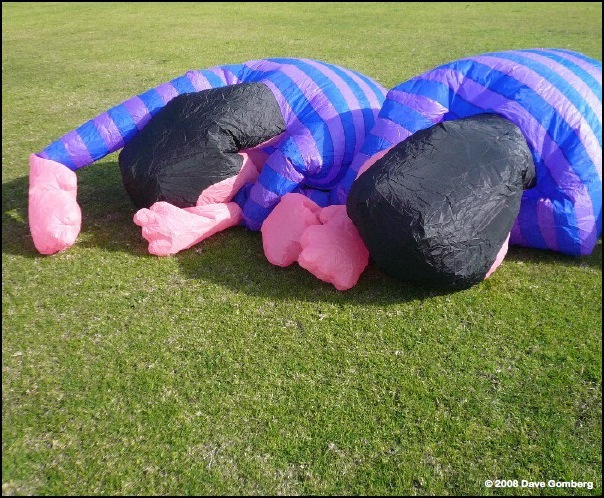 That makes for a long, long day…. 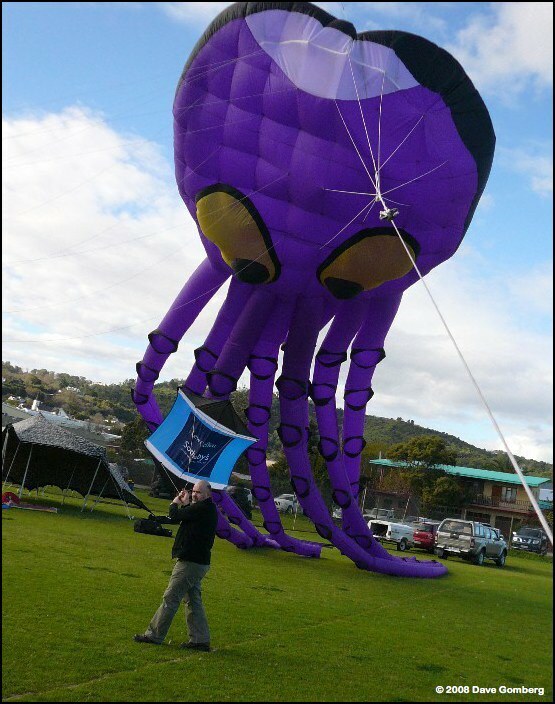 The kite world is a warm and wonderful place. 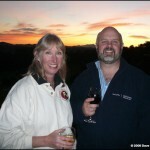 Colin and Melanie Mortimer were kind enough to meet us upon our arrival in Johannesburg and host us overnight. 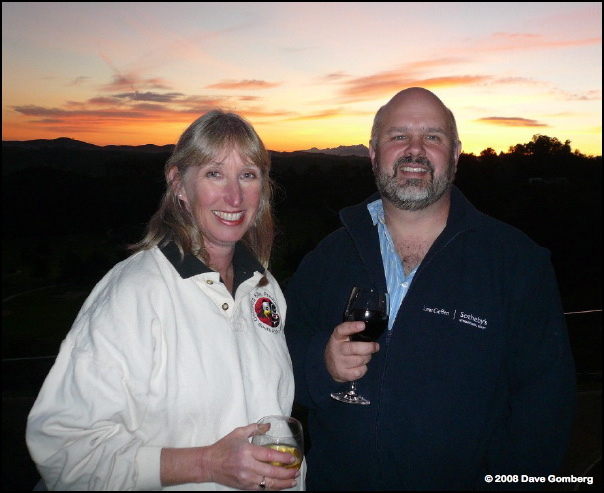 And we especially want to thank Keith and Barbara Mould for their efforts to put this event together and to include us in it, as well as for their hospitality and treasured friendship. The best part about leaving is that we’ll be back in three short months. 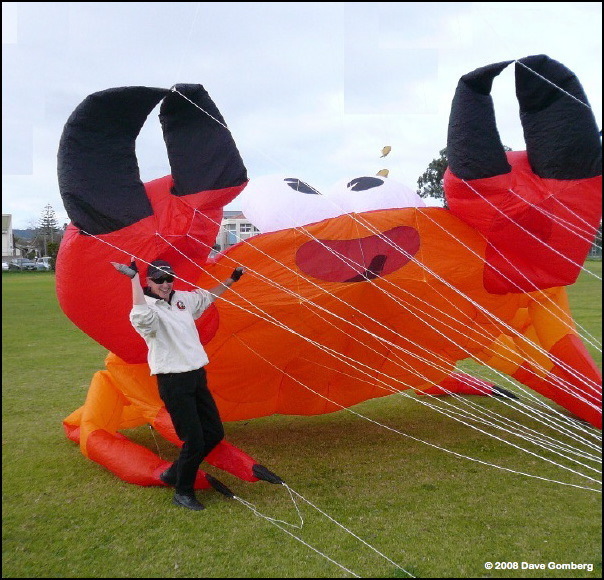 This entry was posted in 2008, Dave's World, Issue 61 (Jul/Aug), Kite Columns, KL Archive and tagged festival, South Africa.